Today's been a day of almost constant wind and rain. I set off from my camping spot early, just to find a more sheltered spot to have breakfast and get ready for the day. I found it at Borgie wood, a forest park a few miles after Tongue. Here I had my coffee and breakfast, took a shower, and studied the map of the road ahead, thinking of possible destinations, and where to stop for necessities, where I might make it to today. Back on the road I drove until I reached Bettyhill, probably quite a lovely place if the sun was shining. I stopped and picked up some smoked haddock for dinner, and a meat pie for lunch in a little shop brimming with everything you might need. I pulled in for lunch at Armadale burn, by an old stone bridge, the van rocking in the wind as I ate my meal and drank tea. The rain continued to pour. Next stop was Melvich beach, just to take a look down the track to see if I could drive right onto the beach. 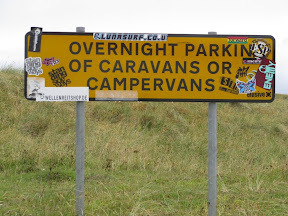 I couldn't but the car park had obviously been heavily populated by surfers, as the sign displayed.. It wasn't a day for getting out of the van so on I went - I was covering more and more distance today due to the weather. I kept going to Thurso and was slightly thrown to discover quite a sizeable town with supermarkets! I hadn't seen one except on rare trips to Inverness. I stopped at Lidl and really stocked up on food and inexpensive treats. Passing through Castletown, I stopped briefly by a huge beach, a potential place to stay over, but I really wanted a 3G signal so I drove on. You might get one on your network there, but I didn't. The next place to go was obvious to me - Dunnet Head. It's the most northerly place on the Scottish coast, therefore that of Britain too, so I had to go there. Probably not a great place to be in a storm, but here I was, so I began the drive up the long narrow road towards the headland. After a number of farms and agricultural buildings the hillside opened out onto pretty barren moorland and climbed up through a series of lochs, through heather, and it was blowing a gale, rain driving down. I came upon old military buildings and concrete foundations and saw a number, of great level spots to camp. Eventually reaching the lighthouse and driving on up to the view point car park, I'd made it to the most northerly mainland point, and the weather only added to the scene. The van was rocking, sea spray was blasting over the top of hundred foot cliffs and I could see a tanker at sea half disappearing beneath huge waves out beyond the lighthouse! I decided it was not a place to spend the night, although I'd usually want to stay in such a spot - the gale was just too disconcerting. I drove about half a mile back down the road and then off down a steep incline onto a level spot on the moor, pretty scenic in spite of the wind. It was a bit sheltered behind a hill but the wind still managed to rock my van once in a while. I cooked a great meal with steamed potatoes, carrots, broccoli and the smoked haddock, and settled down for the evening to watch the first three parts of 'What Remains' on BBC iPlayer - the joy of having an Internet connection even here! The best thing was, I think I only set foot outside my home maybe twice all day..